Hi. I've been experiencing the following problems with the game for 12 days now and I have been wasting my time with Sega Tech Support over it, until I realized these problems are reproducible, regardless of the computer configuration. And since it is the Steam version of the game, I might add that I don't remember experiencing them two years ago. Of course, I had to decide whether to report each of these in a post or all of them in one post. I decided bundling them is the least intrusive way of reporting them. 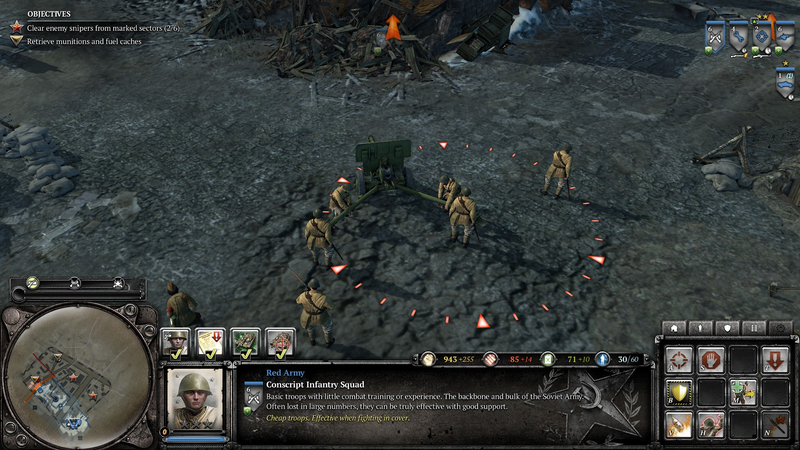 I cannot dismiss the Soviet MG, mortar or AT gun crew using the Transfer Order command. 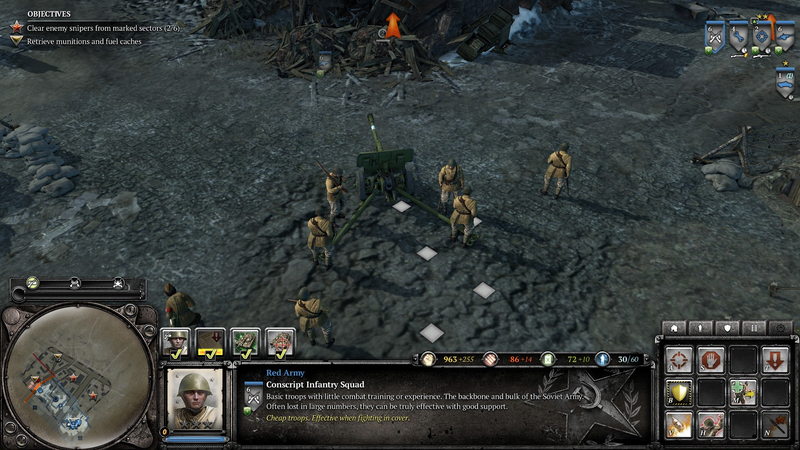 Unlike other units, instead of leaving the battlefield, they only abandon their weapon and stand there. 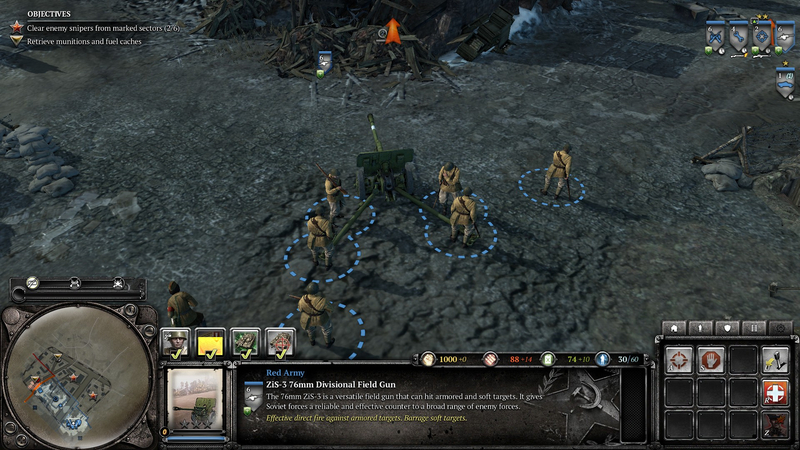 This screenshot shows the same Field Gun Crew after having received Transfer Order. As you can see, they've only dropped their field gun. Alright, let's see what happens if I repeat the Transfer Order. The answer is: Nothing, except the Transfer Order button being unavailable for a while. My only choice seems to be to send them to their deaths somewhere. On several missions (especially mission 3, 4 and 6), I occasionally find Mortars, MGs and AT guns that move EXTREMELY slowly. Engineers try to repair them but they never finish repairing. The repair procedure takes forever. 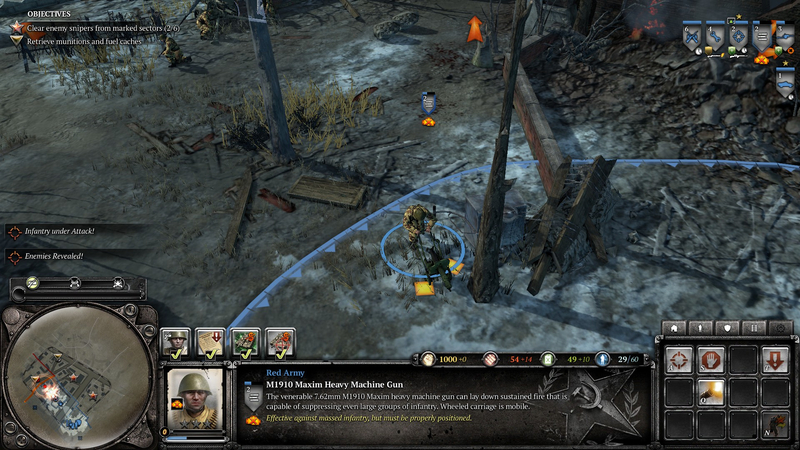 The following screenshot shows an example in Mission 6. In mission 10, I cannot seem to call in Incendiary Artillery Barrage or IL-2 Strafe Support. When I click on their corresponding buttons, the mouse cursor turns into a "not allowed" icon. If I click anywhere on the field, a message says my target is not valid. I don't understand. Also, I consistently receive warnings about incoming German barrages but, the barrages never come. Third, some Soviet Conscripts seem to be able to build sandbag covers while others cannot. The UI button corresponding to this ability does not appear. I don't understand why. Finally, I seem to accumulate command points in the single-player campaign, but it is not obvious what they are supposed to do. I am pretty sure it does not matter. It is reproducible regardless of the rig.